Republican presidential candidate Donald Trump recently gave a non-interventionist foreign policy speech suggesting that he wants to make new allies of old foes and find common ground with them on shared national security challenges. He noted that 88 U.S. generals and admirals have endorsed him, and that "the current strategy of toppling regimes, with no plan for what to do the day after, only produces power vacuums that are filled by terrorists." Trump should tell that to the 51 State Department officials who called for ramping up U.S. military intervention in Syria in an internal memo that was reviewed by CNN in June prior to being classified. Hoping to force Syrian President Bashar al-Assad back to the negotiating table, these State Department officials figured that in lieu of diplomacy, it would be a good idea to prolong a conflict that has already driven millions of migrants -- including Islamic State terrorists -- into Europe and is demographically overwhelming that part of the world. The State Department, which works closely with the CIA in providing official diplomatic cover to CIA officers abroad, has long been at odds with the Pentagon over Syria. It's no wonder that Pentagon generals are backing Trump, while just a few weeks ago a handful of former CIA directors publicly did the same for Democratic candidate and former Secretary of State Hillary Clinton by signing a letter denouncing Trump. Documents sent to and from Hillary Clinton's private email server while she was secretary of state suggest that she wanted to remove Assad despite the power vacuum it would create. In March 2012, according to a document released by WikiLeaks, Clinton instructed special assistant Robert Russo to print an email sent to her titled, "An interesting proposal from (CIA veteran) Bruce Riedel re how Israel could help get Assad out of office." Another email found on Clinton's private email server, this one purportedly from Clinton herself, reiterates: "The best way to help Israel deal with Iran's growing nuclear capability is to help the people of Syria overthrow the regime of Bashar Assad." This is precisely the kind of reckless interventionist mindset that has long infused the State Department. 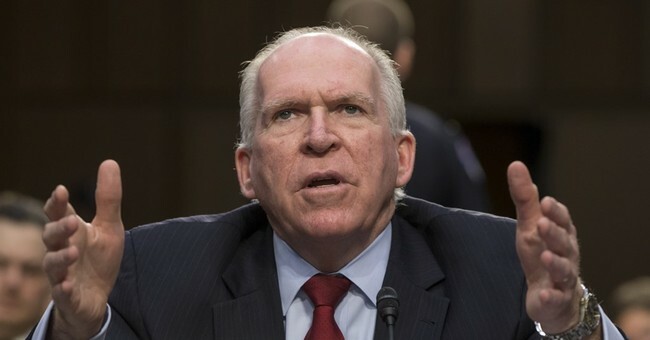 Meanwhile, a classified Defense Intelligence Agency report from August 2012 obtained by Judicial Watch actually predicted the rise of the Islamic State as a result of the U.S. aligning itself with various "rebels." "ISI (Islamic State in Iraq) could also declare an Islamic State through its union with other terrorist organizations in Iraq and Syria, which will create grave danger in regards to unifying Iraq and the protection of its territory," the report stated. This issue underscores the clash of worldviews between the Clinton and Trump campaigns. Former Defense Intelligence Agency Director Michael Flynn, a retired lieutenant general and key Trump defense and intelligence adviser, had long warned about Syria turning into a terrorist hotbed. Former CIA Deputy Director Michael Morell, who has publicly slammed Trump's candidacy, claims that while Clinton was secretary of state, the Obama administration never provided support to the Islamic State or any other terrorist organization. "The administration went to great lengths to ensure that any aid provided by the United States to the opposition would not fall into the hands of extremists, including the Islamic State and Al Qaeda," Morell wrote in an article for Politico. How disingenuous. Morell and Clinton were both serving in the Obama administration during the rise of the Islamic State. We now know that the CIA was, in fact, training the so-called rebels who ultimately joined ISIS or one of the other terrorist groups that currently plague the region. Unlike Flynn, the Clinton-CIA-State Department axis either didn't see the emerging threat, or it didn't mind it enough to nip it in the bud. Even if the Islamic State is ultimately defeated, there are still more State Department proxies waiting in the wings to fill the void and wreak more havoc. Consider the Uyghurs of East Asia, an Islamic group. The World Uyghur Congress, which appears on China's list of domestic terrorist organizations, has received more than $200,000 in annual funding from Congress via the State Department's National Endowment for Democracy. A 2009 State Department cable published by WikiLeaks references a meeting in which Chinese officials asked FBI Director Robert Mueller to "restrict" the activities of an Uyghur leader living in exile in America, adding that China wanted to "boost counterterrorism cooperation with the U.S."
Seven years later, China has just sent Guan Youfei, head of the country's Office of International Military Cooperation, to Syria to forge military ties between the two countries. A Clinton administration, emboldened by interventionist enablers in the CIA and State Department seeking to play their next obvious proxy card in the Middle East, could end up landing America in a direct confrontation with China. Just when you think American foreign policy couldn't possibly get any worse, we might get to see what Hillary Clinton could do with unfettered executive power.